I was about to start with, everybody loves pastries, but I changed my mind. Seems like I used that so many times before. Anyway, everybody loves baked deserts, right? This is one of those recipes mom used to make when I was young…er, and I remember having some in the morning with a glass of milk. Weird enough, I totally forgot about them until a couple of days ago when I had a revelation and here is the recipe that yields around 25 of these beauties. Start by putting the flour in a big bowl and make a well in the middle of it. 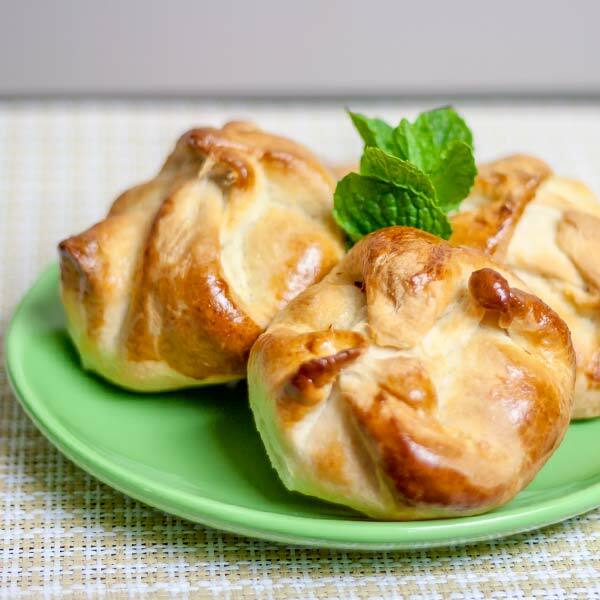 For these pastries I used fresh yeast, however you can use regular active dry yeast, you’ll need about a package and a half. If you’re using fresh yeast, crumble and add it to the well you made in the flour. Now pour the warm water over the yeast and stir with a spoon just so that it dissolves. If you are using active dry yeast, just add the yeast to the warm water, and let it sit for a few minutes until it bubbles up. Next add a cup of vegetable oil to your thing, ½ cup of sugar, half of the lemon zest and 2 eggs. Use a wooden spoon and mix all this or get in there with your hands. Now the other option is to use your mixer, but I decided to do it the old fashion way. If you’re not using a mixer you have to knead the dough for about 10 minutes. Shape it into a ball, and place it in an oiled bowl. Cover with a clean cloth and let it rise in a warm place, until it doubles in size. While the dough is doing its thing, you can prepare the cheese mixture. In a bowl, add the ricotta cheese, ½ cup of the sugar, 1 egg, the other half of the lemon zest and the golden raisins. You don’t have to do this, but I soaked my raisins in some rum for about 1 hour, just for some extra flavor. Mix everything together, and that’s your filling. Place it in the fridge until it’s ready to be used. After about an hour go back to your dough and start rolling it, so that it’s about ¼ of an inch thick or ½ cm. It might be easier to work with half of the dough. Using a pastry cuter cut it in equal squares that are about 3″ x 3″ (7.5cm x 7.5cm). Preheat the oven to 350° F / 180° C. Now the squares you have are not big enough, as you’re working with each square, take the rolling pin and roll it out a bit more, so that it becomes 6″ by 6″ (15 x 15cm). The dough will be quite thin, but don’t worry, it will rise quite a bit. In each square center about about 2 teaspoons of the cheese mixture. Fold each corner and pinch in the middle. Now fold each newly formed corner and pinch it in the middle again, so that your pastry now looks like a flower, see the picture below. Continue folding the remaining squares. When done, brush each pastry with egg. Let the pastries sit for another 10 minutes or so and you’ll see that they rise a bit more. Bake in the oven for about 30 to 35 minutes or until golden brown and enjoy. 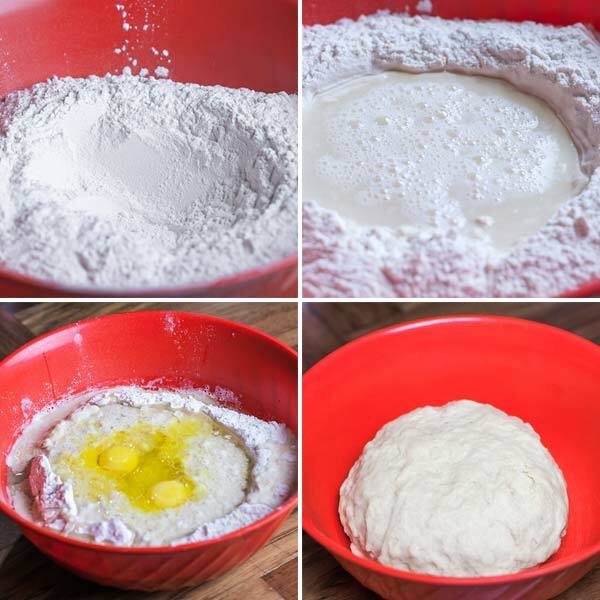 In a big bowl, add the flour and form a well in the middle. Crumble up the fresh yeast and add it in the well. Pour the water over the yeast and stir it up until the yeast dissolves. Add the oil, ½ cup sugar, 2 eggs and half the lemon zest to the well. Using your hands mix everything together and continue kneading the dough for about 10 minutes. Place the dough in an oiled bowl, cover it up with a clean towel, or plastic wrap and let it double in size, in a warm place. While the dough is rising, we can make the cheese mixture. 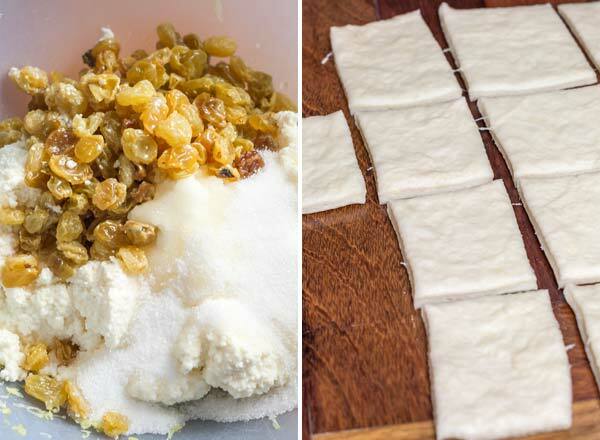 In a medium bowl, add the ricotta cheese, raisins, remaining sugar, 1 egg, remaining lemon zest and mix it all together. 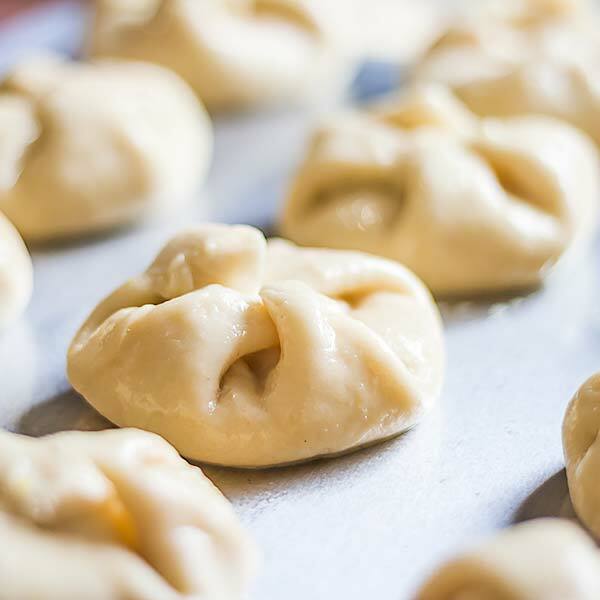 Place the cheese mixture in the fridge while the dough is rising. After the dough has doubled in size, roll it out in a long rectangular so that it’s about ¼ inch in thickness. Using a pastry cutter cut it into squares that are 3" x 3" (7.5cm x 7.5cm). Take each square and roll it up until it’s 6" x 6" (15cm x 15cm), it will be quite thin, but don’t worry as it will rise quite a bit more. Place 2 tsp of the cheese mixture in the center of each square. Fold over each corner of the square over to the middle and pinch to make the dough stick. Now fold each newly formed corner over to the middle again and pinch it in the middle. Make sure you pinch it well, otherwise the dough will open up. Repeat with remaining dough and cheese mixture. Brush the pastries with egg wash and let the pastries sit out for another 10 minutes so they rise a bit more. Bake in the oven for about 30 or 35 minutes, or until golden brown. Cool on wire racks and sprinkle with powder sugar if preferred. These pastries are delicious!!! Thanks for sharing! Would it be possible to use mascarpone instead of ricotta for these? 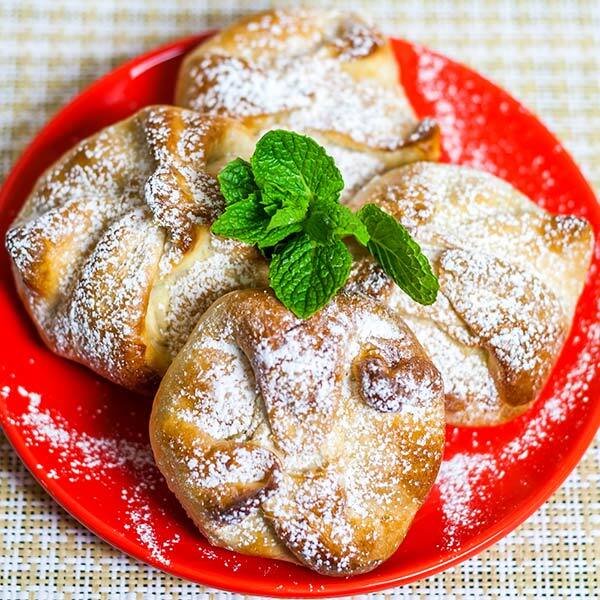 Ive never used either but picked up mascarpone by mistake with the plan to make these. Well, mascarpone is more creamier so I don’t know, maybe if you use less than the required quantity, but hey, there is only one way you can find out. I made these today and they are delicious! Thank you so much for the recipe. You make it very easy to follow each step. Very pleased with the way they came out.